Flying is one of the most dehydrating things I do to my body. I prep like I’m trying to blow up a raisin with moisture. I cleansed as normal then went straight in with Tata Harper Resurfacing Mask, a really easy and gentle way to resurface if you have particularly sensitive skin – it goes on like jelly and hardens like egg white. I then applied Chantecaille’s Gold Energizing Eye Recovery Masks to work while the Tata was on. I left both for 15-20 then removed the eye masks and washed off the Tata with warm water and flannel as per usual. The next is easy and simple. 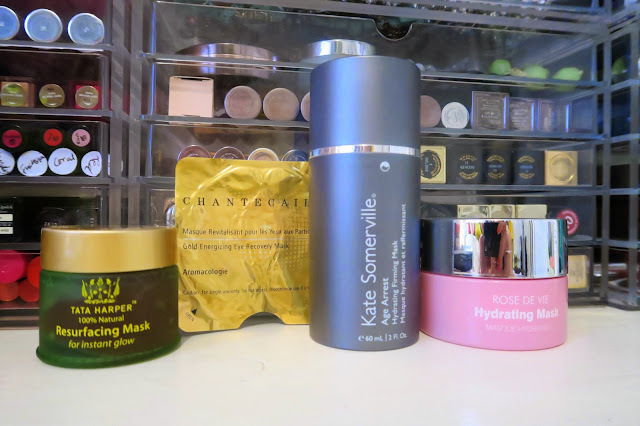 Straight on with Kate Somerville Age Arrest, let that absorb for a few minutes then apply Sebagh Hydrating Mask on top. That’s my skincare for the day. I don’t take them off, I just apply more as and when they’re absorbed. Post-showering and leg shaving (no time for waxing over here) I went straight in with Rahua Body Lotion on the upper body followed by Clarins Moisture-Rich Body Lotion. I save my expensive body lotions for traveling/extra treats – I use mostly budget normally. After that, it’s self-tanner time – and in this case Michael Kors is my go-to. I just like it and it suits my skin. Body done, hair then gets some Grow Gorgeous Hair Growth Serum which I just apply all across the top of my hairline and in the front of my parting. Years of blow-drying take their toll so I try and just give my hair some help when I have time. I’ve been using Phyto 7 (and 9) ever since I was first trained in it nearly 20 years ago in SpaceNK. It’s a leave-in treatment so whenever I know I don’t have to blow dry, I try and apply this as an apology to my hair for the bleach and blowdrying! My hair then stays in a loose bun all day, with occasional shakeouts and reapplication. Finish off with a little lip treatment from Clinique All About Lips and that’s me hydrated to the max. 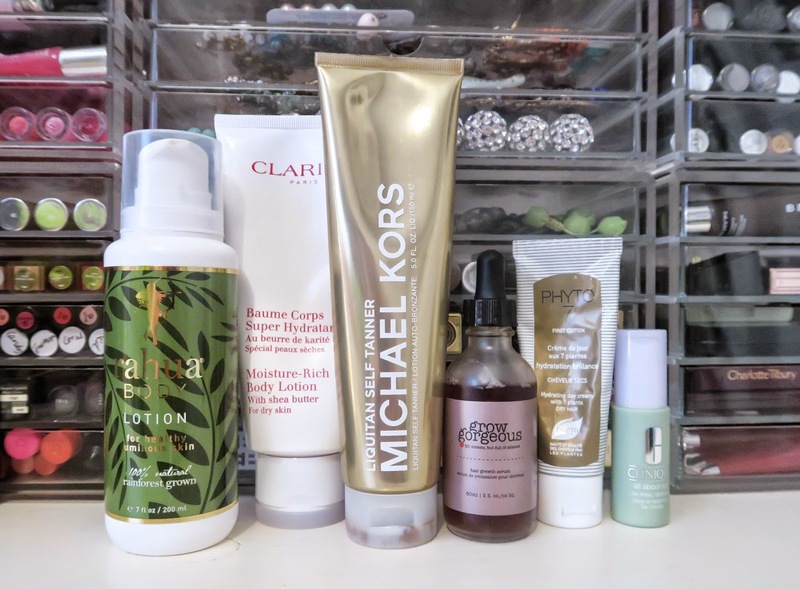 Tomorrow: What’s in my long haul beauty travel kit?